jimmy's cocktail hour: Whiskey for the People. For some reason, Pikesville only appeared here in Boston in the last month or two (at least to my eyes which have seen many a store's shelves). A great Maryland style (non-spicy) rye that's about the same price but a little higher in quality than Old Overholt. I used Pikesville in one of my drinks for this Mixology Monday with great success! Oh me oh my I like affordable Rye. I'll have to get some CA friends to help me out. Thanks, Jimmy! 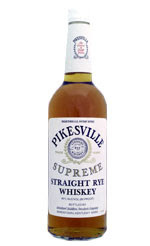 I haven't gotten around to trying Pikesville yet, but now I'll have to give it a try. This totally reminds me of Wondrich's "Hotel Room Old-Fashioned"—which is to say, a great idea. I'll drink just about any whiskey in a pinch. Old Grand-Dad, for example, tastes like my childhood. I remember getting to eati the whiskey-soaked cherries out of the bottom of my dad's and grandfather's glasses.